René is always happy to sign autographs for fans, and donates the money he receives to Médecin San Frontières/Doctors Without Borders to support their life-saving projects around the world. 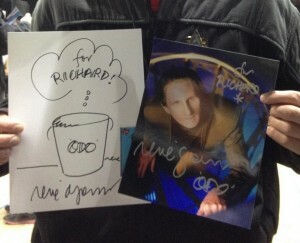 At your request, René will autograph and personalize any of these for you. We ask for US$30 per item (US$40 to 45 for addresses outside the United States). After postage costs, the rest of your payment will be donated to MSF/DWB by René. Be sure to specify which item you’re requesting and how you’d like René to personalize the autograph (with what name) – and don’t forget to include your address! Use the “notes” or “instructions” space on the PayPal form, or send us an e-mail with your details.